A whopping 252 acres of land acquired for the Mopa international airport will be utilised for commercial development, Chief Minister Laxmikant Parsekar said on Thursday. 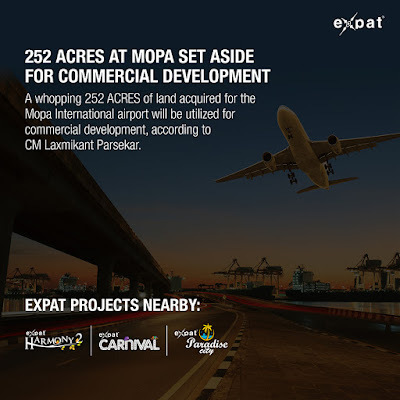 Addressing media persons, Parsekar said the Mopa airport, the second international airport in Goa, will be built on an area of 84,68,261 sq mtrs (2093 acres), of which 252 acres, over 12 percent of the area, would be utilised for commercial development. The first phase of the airport will be completed by 2019-2020 and will handle 4.5 million passengers annually, Parsekar said adding that the concession agreement with Bengaluru-based GMR Airports Ltd would be signed on November 8, adding that Dabolim airport will continue to retain its existing status of being an international airport. Prime Minister Narendra Modi will lay the foundation stone for the airport along with that for the Electronic City at Tuem on November 13 during his visit to the State. Both projects are proposed on public-private partnership (PPP) model. Speaking in presence of cabinet colleague Rajendra Arlekar, who is the Pernem MLA, the Chief Minister said that the first phase of the airport is expected to be completed by 2019-20 with a total handling capacity of 4.5 million annually. “It would be incrementally increased to 13 million by completion of the fourth phase. The ultimate capacity of the airport is 28 million annually,” he said. Asked whether the State would be in a position to handle such a large passenger load, Parsekar said that during the BJP tenure, the State recorded a substantial rise in tourist inflow. “In the first year it went up by 20 percent, then 25 percent and in the last season it touched 30 percent rise. We have been able to handle such huge traffic and will continue to do so. It is one of the leading revenue generation sources for the State,” he said. The airport with code 4F runway, will be capable of handling A380 Jumbo jet aircraft with unrestricted flight operations, Parsekar said. “Having no time restriction, airlines will be able to decide on their efficient fleet and route planning and this will help in competitive costing,” he said adding that the facility will also have a state-of-art terminal building. The electronic manufacturing cluster proposed at Tuem, in an area measuring 5,97,125 sq mtrs, has been sanctioned Rs 50 crore by Central government and the amount is likely to go up to Rs 60-70 core in the next few days. “For the very first time, BJP has managed to give two MLAs to Pernem and both are ministers. One is a chief minister. This is the biggest benefit that a remote taluka like Pernem has got. Both projects will help the remote villages to get international status,” the Chief Minister said. Asserting that in both the projects the bid documents make it mandatory for providing employment to locals, Parsekar said the projects will have significant impact in case of increase in air traffic, job creation and boosting overall state economy.